There no macroeconomic releases in the UK today, traders will watch global macroeconomic data. The support rests at 1.30840 with resistance at 1.31200 which both lines are above the weekly pivot point at 1.30730. The EMA of 10 is moving with bullish bias in the descendant channel and it is below the EMA 100 and above the EMA of 200. The RSI falling towards 50 level and the Stochastic is moving in high ranges. The MACD line is above the signal line in the positive territory. The ADX is showing buy signal. 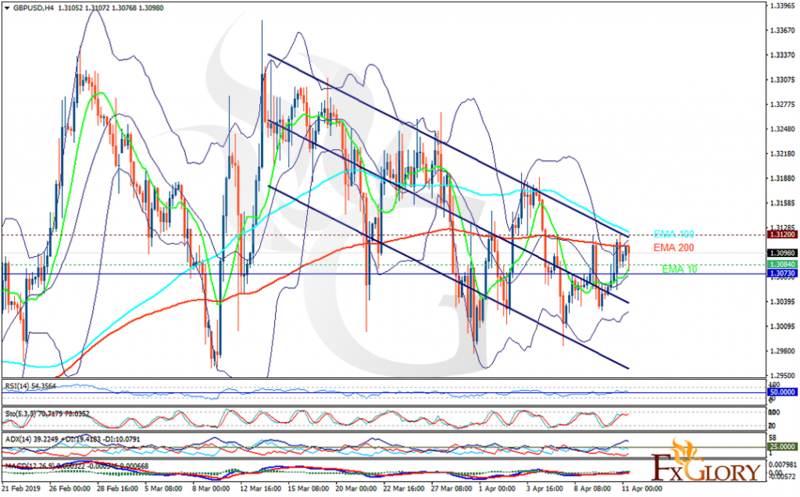 The price has almost reached the upper Bollinger band, GBPUSD may fall towards the lower band at 1.30200.